Several models of the 2002 to current Toyota Alphard and Vellfire are eligible for import to Australia under SEVS, based on being either a Hybrid or a Welcab / Welfare vehicle with disabled access features. To check current pricing and availability, you can use our Auctions page to view 3 months of Past auction sales across Japan for the Alphard Welcab and Vellfire Welcab, as well as upcoming auction vehicles available to buy. 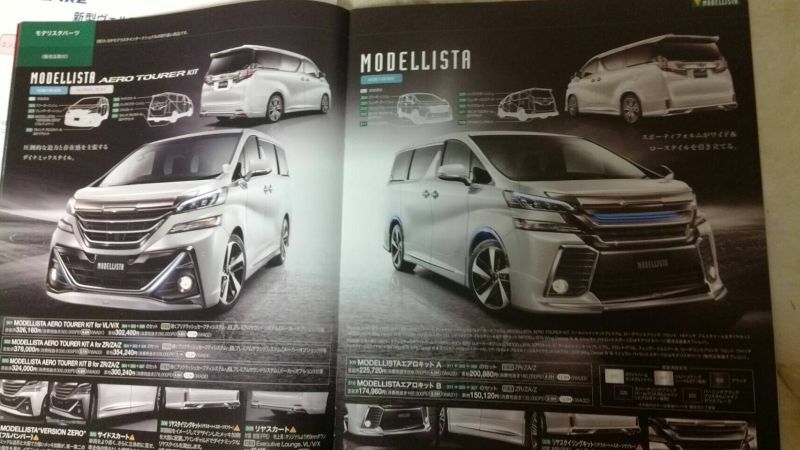 The Toyota Alphard and Vellfire models have remained Japan’s best selling people movers for much of the time since their first release in Japan in 2002. 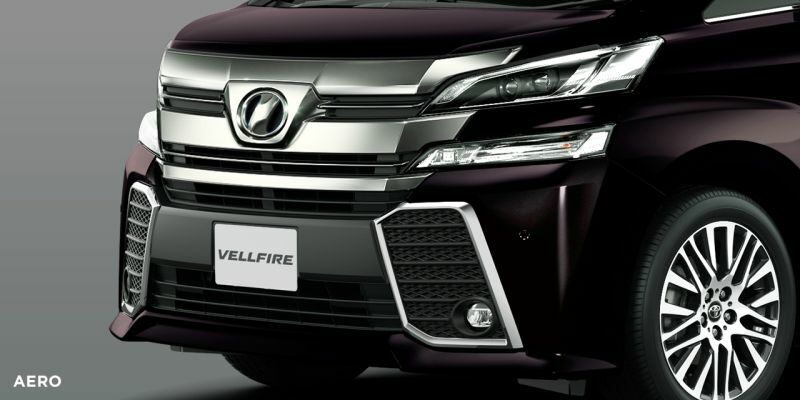 Their popularity is in part due to the impressive range of features available in the Alphard and Vellfire together with Toyota’s focus on driver and passenger comfort. 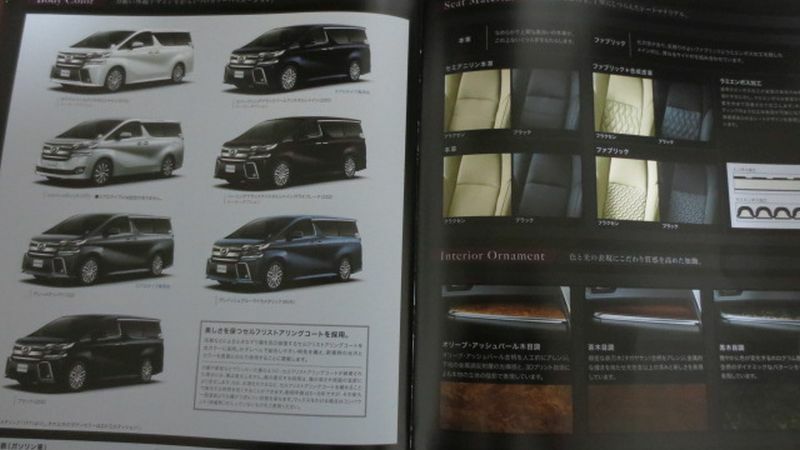 Both the Alphard and Vellfire Executive Lounge models are fitted with many luxury appointments. 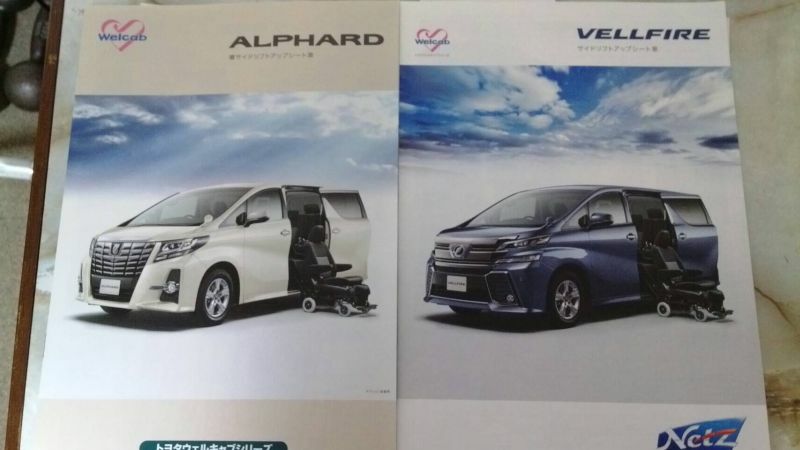 “Welcab” or “Welfare” versions of the Alphard and Vellfire are ruled eligible for import to Australia under SEVS on the basis of having factory-installed features for disabled passengers. For the 30 Series models, these include removable wheelchair, side lift-up seat or passenger lift-up seat. The wheelchair ramp (sloper) option which was available in the earlier 20 Series model is not available in the 30 series. The side lift up seat option is unobtrusive and operates as a normal seat, the base is only slightly larger than the regular seat to allow for the electric mechanism. This can also be easily replaced with a standard factory seat if desired. 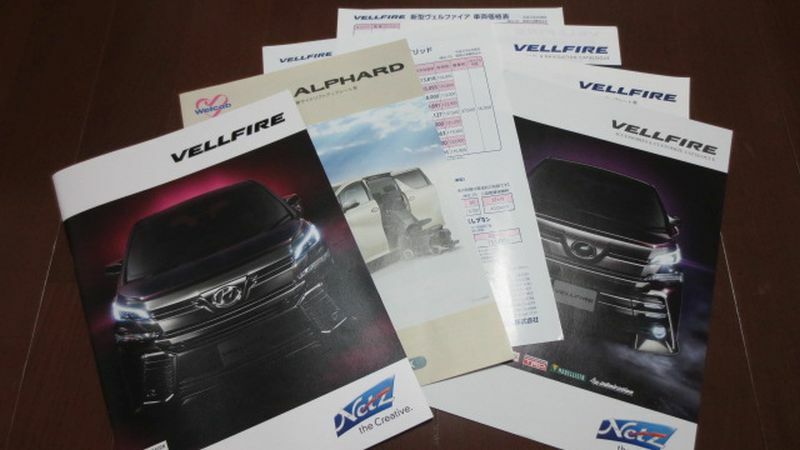 We anticipate that SEVS compliance will be available for both Alphard and Vellfire 30 series Welcab models by the end of 2016, from which time we will be able to source this model for direct import (secondhand and new). View the SEVS Ruling for the 2015+ Toyota Alphard 30 Series Welcab / Welfare. View the SEVS Ruling for the 2015+ Toyota Vellfire 30 Series Welcab / Welfare. 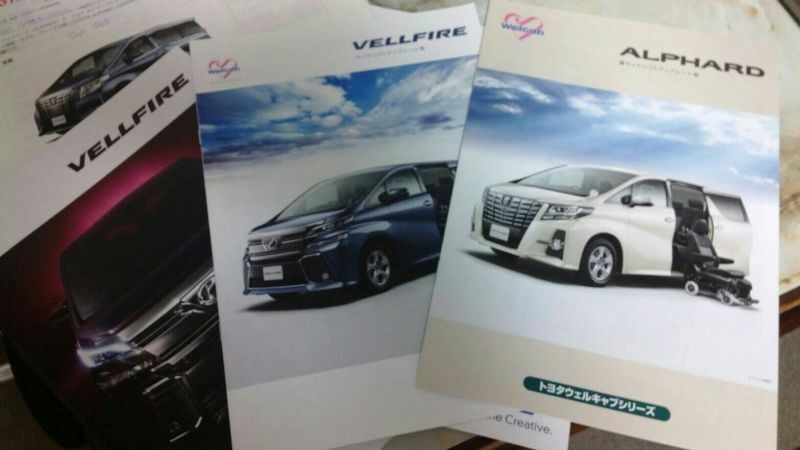 Yes, if you wish we will also be able to order you a new Alphard or Vellfire directly from Toyota Japan, fitted out to your exact specifications. 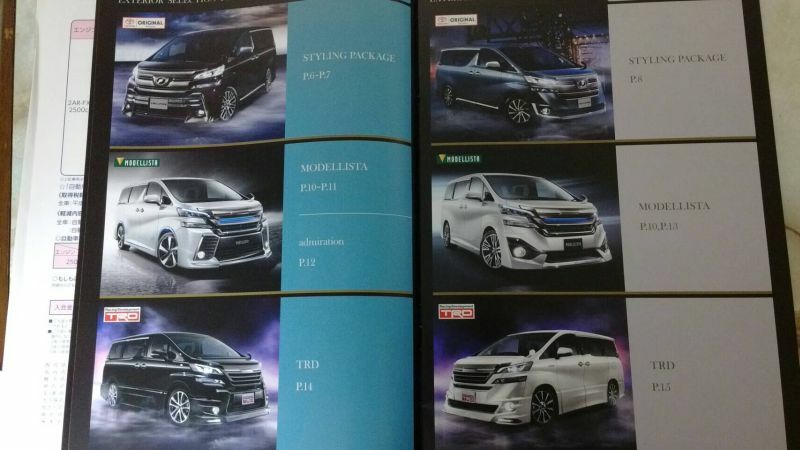 Further information and pricing below for the Alphard and Vellfire comes from the Toyota Global Newsroom and Toyota Japan. 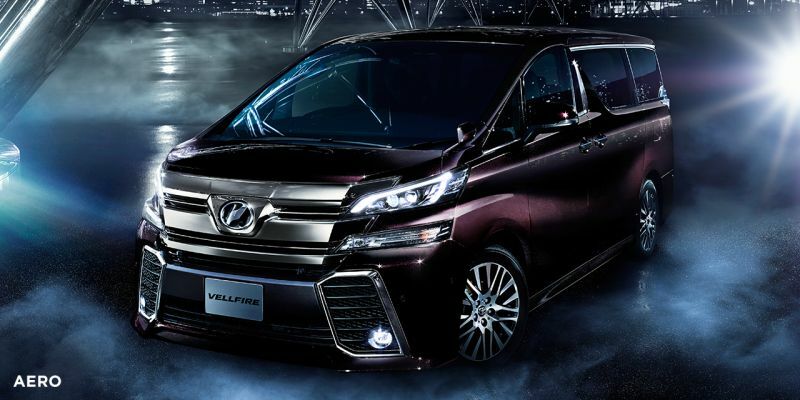 Toyota City, Japan, January 26, 2015―Toyota Motor Corporation launched the redesigned “Alphard” and “Vellfire” minivans through dealers across Japan. The vehicles were developed to incorporate the idea of a roomy and luxurious saloon space with a new and unprecedented sense of refinement. The new Alphard and Vellfire possess unshakeable presence with a comfortable ride, exceptional handling stability, and a roomy interior. 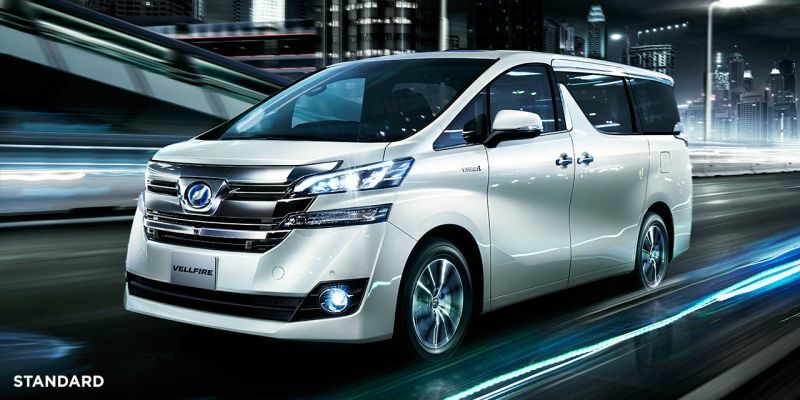 The Alphard exterior emphasizes luxury, while the Vellfire exterior emphasizes boldness. In addition to high body rigidity, a newly developed double-wishbone suspension was adopted for the rear to achieve a luxurious ride and exceptional handling stability. Extensive sound and vibration dampening and an aerodynamic wind-noise reducing body shape realize a quiet ride at all speeds, befitting of a luxury vehicle. The new models also feature world-first1 advanced equipment such as the Panoramic View Monitor2 with new See-through View, which gives a driver’s-perspective view of the vehicle’s surroundings as if the vehicle itself were transparent, and Intelligent Parking Assist 22 with new multi-point turn support that controls steering in tight parking spaces which require repeated back and forth movement. Inabe Plant, Toyota Auto Body Co., Ltd.
*2Prices for four-wheel drive vehicles are 250,363 yen higher. *3Consumption tax does not apply. Prices for four-wheel drives vehicles are 232,000 yen higher. *4Prices for four-wheel drive vehicles are 250,364 yen higher. *5Prices for four-wheel drive vehicles are 194,400 yen higher. *6Consumption tax does not apply. Prices for four-wheel drive vehicles are 180,000 yen higher. *7Consumption tax does not apply. 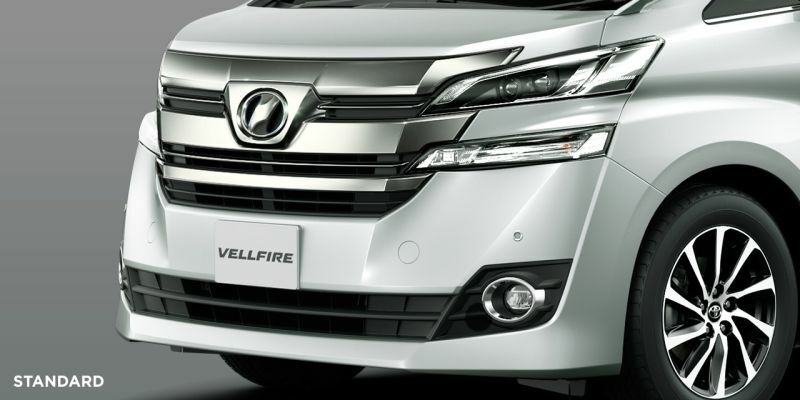 The respective exteriors of the Alphard and the Vellfire have their own unique presence, with commanding and robust power that aims to achieve strength, luxury, and exhilaration beyond expectations. The dynamic design integrates the shoulder area that starts at the headlamps and stretches powerfully towards the rear in a radial pattern, the sculpted and bulky underbody that accentuates the area around the wheels, and the cabin with strikingly large glass windows. The large front grille features thick mesh ornamentation and is integrated with the lower grille to create an impressive front view that conveys the vehicle’s unique boldness and individualistic luxury. The U-shaped structure that merges the rear combination lights with the license plate garnish creates a rear view that emphasizes the wide feel and powerful underbody. The front grille, made of wide plated bars seemingly etched from a sheet of metal, combine with dual headlamps and a wedge-plow-shaped under bumper to create a front view conveying robustness and dramatic power. The rear combination lamps―with blacked-out top and bottom―mesh with the license garnish to form a wide and powerful rear view. A novel structure created by the seamless connection from the instrument panel to the door trim and the protruding center cluster express an open and roomy space. The elaborate workmanship of the interior stresses the quality of the materials and combines with sculpted metal surfaces and wood-grain ornamentation for a unique impact. The wood-grain ornamentation impresses with a design that focuses on light rather than colour. A high-quality brown wood-grain finish that expresses depth with the brightness of metal between the patterns and the world’s first hologram base layer were adopted. A new black wood grain finish that conveys dynamic patterns using dark colours creates a clear identity for its grade. Seven body colours are available for each model including the following exclusive colours. Interior colours are flaxen and black. A new double wishbone suspension is used for the rear. Areas where high-tensile strength steel plate is used were thickened and a structural adhesive was introduced to increase body rigidity and achieve a luxurious, comfortable ride with stable handling. Vibration control and soundproofing materials, as well as effective placement of sandwich steel plates3 and an aerodynamic wind-noise reducing vehicle body shape were pursued. This results in a quiet ride at all speeds, as befits a luxury vehicle. A 2AR-FXE 2.5-liter Atkinson-cycle combustion engine is combined with six-speed Sequential Shiftmatic and E-Four (electric four-wheel drive system) to create a hybrid system with a fuel efficiency of 19.4 km/L4 under the Japanese Ministry of Land, Infrastructure, Transport and Tourism’s (MLIT) JC08 test cycle. The new 2AR-FE 2.5-liter engine is used with a seven-speed Sports Sequential Shiftmatic and Super CVT-i and the optional5Stop & Start System to provide fuel efficiency of 12.8 km/L6 under Japan’s MLIT JC08 Japanese test cycle. The 2GR-FE V6, 3.5-liter engine is combined with six-speed Sequential Shiftmatic with 6 Super ECT to provide fuel efficiency of 9.5 km/L7 under Japan’s MLIT JC08 test cycle. Except for models with the 3.5-liter engine (four-wheel-drive models weighing 2,100 kg or less), all models exceed MLIT’s 2015 fuel economy standards8. Certified as having emissions that are 75 percent lower than the 2005 standards9 under the MLIT’s Approval System for Low-emission Vehicles, the Alphard and Vellfire are eligible for the Japanese government’s subsidies and tax incentives for eco-cars. Even with the height lowered 10 mm (to 1,880 mm10); abundant interior roominess with an interior height of 1,400 mm is maintained. An easy-to-reach long assist grip and a step height of 350 mm10 allow easy ingress and egress for both young children and the elderly. A large, 148-liter11 cargo area under the third row seat sliding mechanism provides world-first1 under-floor storage of such a size. The deck board folds into three sections to provide both a sliding third row and under-floor storage. A super-long-slide passenger seat2 allows new seat configurations. Placing the front passenger seat on the same seat rail as the second row seats enables a super-long-slide of a maximum 1,160 mm. Maximum utility is provided by new seat configurations including an extra-long luggage mode―which allows a large cargo area able to accommodate a maximum length of 2,150 mm on the front passenger side―and a “double-triangle” mode that enhances communication between passengers in the second and third seat rows and the front passenger seat. LED roof illumination bathes the entire roof in light and is a standard feature on all models. Four brightness levels and 16 colour variations create an interior space with a sense of understated luxury. The world-first1 Smart Entry & Push Start System (with new Welcome Power Slide Door & Reservation Lock function)2automatically opens the sliding door as the user approaches12 the vehicle after previously setting a reservation13. Also new is a reservation lock function that automatically locks the door after it closes. Intelligent Clearance Sonar (with eight sensors)2 with new functions supports collision avoidance during low-speed maneuvering regardless of accelerator or brake pedal operation and mitigates collision damage. The sonar’s sensors were improved and the object detection range increased. The control software was updated, and now, in addition to mitigating collision damage resulting from pedal misapplication, the system supports collision avoidance and mitigation of damage caused by low-speed collisions with other vehicles or obstacles in front. The Pre-collision System2 uses millimeter wave radar to detect vehicles and obstacles on the road ahead and helps avoid risks. If the system detects a high likelihood of collision, it triggers an alert while activating the automatic pre-collision brake assist and pre-collision brakes14 to prevent a collision or mitigate damage from impact. The new models also feature world-first1 Panoramic View Monitor (with left and right visibility support and See-through View function)2 that gives a driver’s-perspective view of the vehicle’s surroundings as if the vehicle itself were transparent. Pressing a button allows the driver to flip between the Moving View―which displays a top-down view of the vehicle and its surroundings―and the See-through View. Also available for the first time in the world1 is Intelligent Parking Assist 22, which uses ultrasonic sensors and a camera to detect parking spaces. By working in tandem with the Intelligent Clearance Sonar, the system uses automatic braking to avoid collisions and mitigate collision damage. Parking has been made significantly easier through the addition of a new multi-point turn support function15 that automatically operates the steering wheel, and a parallel parking departure support function15that supports steering wheel operation when leaving a tight parallel parking space. Radar Cruise Control (with All-speed Tracking function)2 uses data from millimeter wave radar to detect the vehicle ahead and maintain uniform vehicle separation with preset vehicle speeds from 0 km/h to 100 km/h, making driving in heavy highway traffic easier. 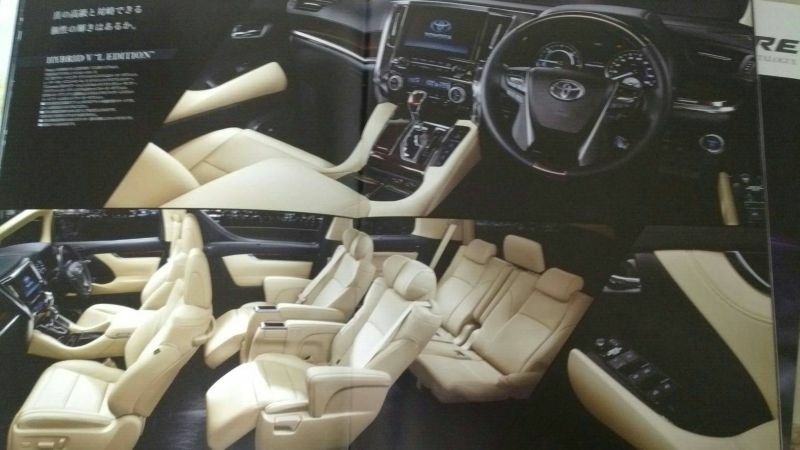 The new Executive Lounge grade, which places emphasis on the rear seats, is available in both the Alphard and Vellfire series. Exclusive tuning of the suspension provides a more luxurious ride suitable for a luxury-class grade. The second row seats are approximately 100 mm wider, providing roomy comfort on exclusive executive lounge seats. In addition to comfort rivaling that of a sofa, a power ottoman (with extension function) extends about 140 mm, while heated seats, ventilated seats, a stowable table, and other amenities enhance convenience and comfort. Olive ash burl wood grain is combined with a metallic reflective base layer and the world-first1 three-dimensional shading created using 3D printing technology to produce previously unseen ornamentation designs with a high quality feel. The 12.1-inch rear seat entertainment system features a high-definition wide video graphics array (WVGA)16 display that electrically opens and closes using a remote control. The JBL17 premium sound system with a high-performance 12-channel amp and 17 speakers delivers optimal sound quality in the roomy interior. Aerodynamic parts for Alphard S, SA, and SR grades and Vellfire Z, ZA, and ZR grades are also available. These feature side spoilers that emphasize the vehicles’ low center-of-gravity and highlight the solid body and ground-hugging stance. A distinctive front grille, the powerful and large side pontoons on both sides and the refined configuration around the headlamps create a robust and sporty feel. The trapezoidal lower grille with large plated bezels and projecting under-spoiler support the upper grille, giving the vehicle a wide and dramatic look that creates a sense of stateliness and convey dynamic power. The Side Lift-up Seat model in the Welcab series has acquired vehicle-type certification in Japan. This reduces the effort required for individual registration and cuts the lead time before vehicle delivery. The Welcab Side Lift-up Seat model (detachable type) has a second row seat that doubles as a wheelchair, and usability is improved through an automatic memory function that stores forward and backward sliding positions and reclining angles during seat storage. *2Prices for four-wheel drive vehicles are 232,000 yen higher. *3Prices for four-wheel drive vehicles are 216,000 yen higher. 3Compound steel plates with a layered structure and vibration-control materials sandwiched between the plates. 6Two-wheel-drive vehicles with vehicle weights below 1,990 kg. 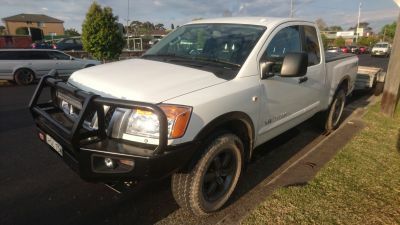 7Two-wheel-drive vehicles with vehicle weights below 2,100 kg. 10Two-wheel-drive vehicles with gasoline engines and 17-inch tires. 11Measured using the VDA method. With the spare tire present: 66 liters. 12The outdoor detection area is within a radius of about 0.7 m to 1.5 m from the sliding door handles on the left and right sides. 13Reservation operation using a smart key. The reservation period is about 20 minutes. 14A function that automatically slows the vehicle even if the driver does not press on the brake. Necessary functionality may not be present depending on weather and road conditions. 15The driver operates the gear shifter, accelerator, and brakes. 17JBL is a trademark of Harman International Industries, Inc.